Lexus IS Forum > Vendors > TH Motorsports > Fortune Auto 500 Gen 6 Coilovers with FREEBIES! Fortune Auto 500 Gen 6 Coilovers with FREEBIES! The new Gen 6 coilovers are now available! The all new Fortune Auto FA500 Gen 6's have been released and feature a few new upgrades to the hardware components, as well as a longer manufacturers warranty! The Gen 6's now come with a 5 year manufacturers warranty, improved digressive piston technology, fully revalveable and rebuildable and much more damping adjustability! These coilovers are built right here in the U S of A! They are fully serviceable and rebuildable. No more waiting on overnight parts from Japan! I hear these would pull a premium one week before RaceWars. They can be upgraded from rebound adjustable to double, to triple, to external reservoirs! Each of these shocks are dynoed to ensure consistent performance. Digressive valving means these are excellent at controlling low piston speeds incurred by things such as roll, dive, and squat, but can bleed off high piston speeds to retain comfort over bumps, cracks, and the occasional crowd of protestors that you run over! These have excellent ride quality on the street, as well as great performance on track or at autocross. We can of course build them to drift too . These units are built to order, so we can spec any spring rate and any valving to custom suit your needs and at no additional cost to you! 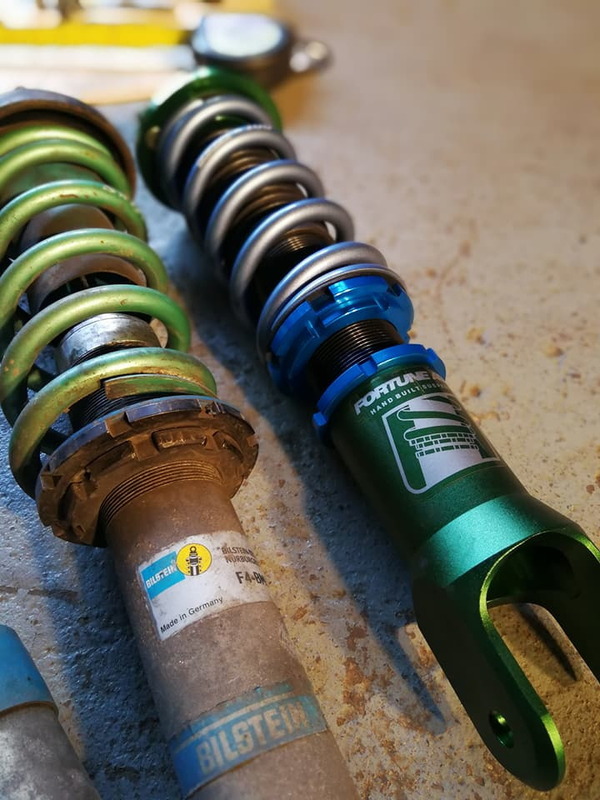 I guarantee the lowest pricing on FA coilovers. 35% increased damping adjustment range, bleed holes are CNC machined, upgraded jetting. This means that adjustments are far more consistent and repeatable. Flow is also improved. Knobs are now CNC machined instead of cast and have a nice positive detent click to adjustments. Updated shaft end caps are lighter and nicer looking. Also have new optional all aluminum bodies for lighter weight and improved heat dissipation. And since we're heading to SEMA at the end of the month, we decided to include up to $150 worth of freebies! Free locking spring perches! Free radial bearing upgrade (where applicable)! If they aren't applicable, we'll find some other way to sweeten the deal! We build each and every one of these to order. That means that I will have a discussion with you about your setup and you're intended use. I'll make some spring rate and valving recommendations and we go from there. We can also build these as drag spec for you big power radial guys who like to hit the strip. We can spring and valve them to really squat and get that hole shot. Locking perches come standard. No more lime green springs - they're a higher quality spring. Some additional machining done to lighten things up as well!